There’s not much to the yearly view, but at a glance you can see the current calendar year, or scroll up or down to see prior or future years. Unfortunately, from this view you can’t tell on which days you have appointments. 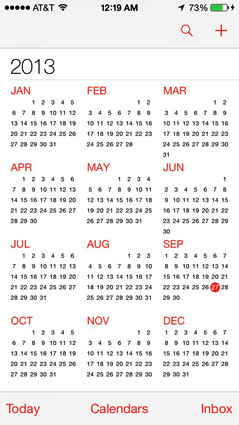 Tap any of the months visible in the yearly view to jump to that specific month. 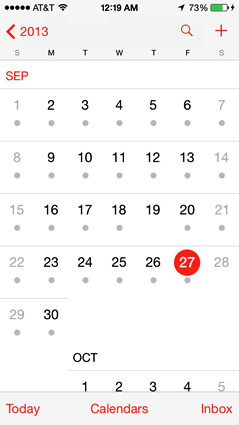 When your iPhone is in month view, a gray dot appears on any day that has an appointment or a scheduled event. 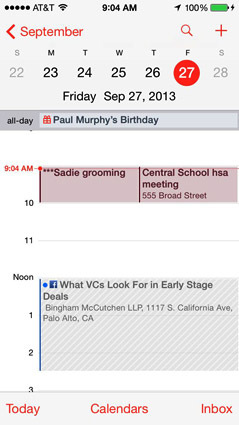 Tap a given day to see the list of activities on the agenda for that day. As previously mentioned, you have to tap a date to see what you have going on in a 24-hour period — though to see an entire day’s worth of entries, you’ll have to scroll up or down. You can swipe to the left to advance to the next day of the week and beyond; swipe to the right to retreat one or more days. In this day view, all-day events, birthdays, and events pulled from your Facebook account (if you provide your Facebook credentials) appear in a narrow strip above the timeline for the day. 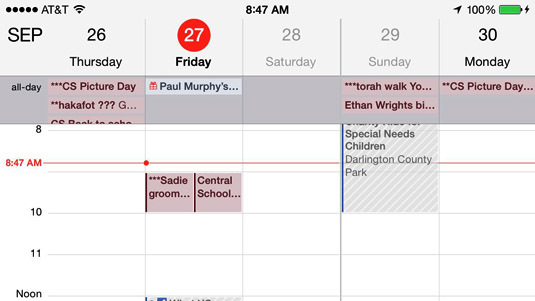 Your daily appointments span the entire time in which they’ve been scheduled on your calendar. You have to rotate the iPhone to its side to examine your weekly calendar. In this view, you can glance at only five days’ worth of entries (fewer on the 4 or 4s), so you must scroll in either direction to peek at any days that are not initially visible. The current day is circled in red. You can arrange to start your weekly view on any day of the week. 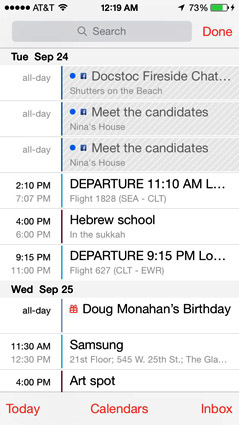 Tap Settings→Mail, Contacts, Calendars→Start Week On, and then tap the day on which you want to start your week. List view isn’t complicated. You can get to the list view from the yearly, monthly, or daily calendars by tapping the search (magnifying glass) icon near the upper-right corner of the screen. As you would expect, all your calendar appointments are listed chronologically. If you have a lengthy list, drag up or down with your finger or flick to rapidly scroll through your appointments. If you’re looking for a specific calendar entry, you can search for appointments by typing the titles, invitee names, locations, or notes in the search box above your list of entries.